Debra from Quiltingartist tagged me for this hop and though I participated earlier this summer, I couldn't resist her creative challenge to update by new followers. I am always inspred by what an inventive quilter she is and love her artistic approach to quilting. I'm a pretty eclectic quilter/blogger. I took my first piecing class in September of 2009 and made the above Pinwheel Quilt. I started blogging one summer day in June of 2013. I live in the United States, in the beautiful state of Oregon. My blog is a place for me to connect with others who share my same passions. It's a place for me to document my works of heart as a quilter, along with snippets of life that go on in-between at home and as a second grade teacher. I'm a life-enthusiast and there are not enough hours in the day to accomplish everything I want to get done! Visiting my blog, you'll notice I'm a pretty eclectic sewer who dabbles in applique, English Paper Piecing, (love my hexagons) traditional and out-of-the box piecing, long-arm quilting, quilt/sewing area organizing (See my Sunday Organizing Series). I have many W.I.P. but let's not talk about those! (wink! wink!) Feel welcome to check out my "pages" and/or "labels" in areas that may have sparked your interest. Hopefully you'll be inspired by what you see and you become a "follower" and I can visit your blog as well. How is my work differ from others? What makes my work unique? 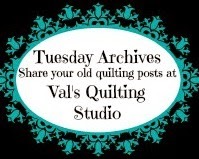 I received the nicest compliment from a fellow blogger last week so I'm going to use her description to answer this question: " Val is a quilter and she makes imaginative, happy quilts and she is lightning quick! Val's dog Jackson is a supermodel who somehow makes his way into most quilt pictures! " See....I told you it was nice! LOL! Annnnddd I have to admit, I do have a great quilt model too: Jackson! He's definitely my empty nest, quilting, walking companion. A Quilting Discount for You! Most recently, I've been working to establish myself as a long-arm quilter. 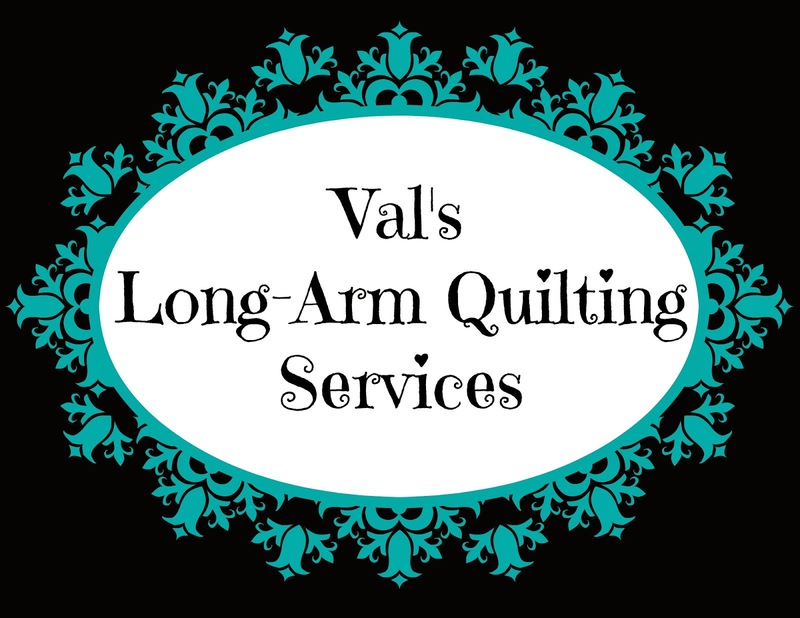 If you are looking for a long-arm quilter, click right here! I have an extensive selection of patterns and offer quick turn-around service. So how does my creative process work? Not a day goes by that I'm not stitching, sewing or quilting...even if it's just while watching TV at the end of the day. I'm a list maker. So each week starts with a list of blogging and quilting goals. I've always been crafty and realize it's just a part of who I am. See ya tomorrow for Tuesday Archives. Tomorrow's themes are two of my favorites: Hexagons and Houses! Thanks for listing my blog, Val. I enjoyed reading "all about you" again. Love the quilts you showed, especially the Play. It's a pleasure to see you and Jackson again. See you tomorrow for the hexie show. Great post! Nice to get to know you better and see the eclectic quilter you are! Thanks for sharing - these are fun to read!! Love seeing your buddy in your photos. Thanks for the mention! I really enjoyed reading your post. I'm definitely going to check out your Sunday Organizing Series! Jack is adorable. Good providence w/your Long Arm Quilting service! Val, What a wonderful post! I now feel like I know you even better! Thank you for accepting my invitation to do the World Blog Tour again. Your work is inspiring, creative and fun! Also love stopping by to see Jackson! Looking forward to all your future "play"